Battleborn’s Winter Update is on the horizon and with it comes two brand new training modes, Incursion Tutorial and the Dojo! With these modes, new players will be introduced to basics of Battleborn characters and PVP gameplay, while veteran players will be able to practice and hone their skills. One of the biggest requests we have had from the community is a better tutorial system. Between character abilities/helix choices, in-match growth, mode rules, in-match economy, and team strategy, there is a lot for new players to try and figure out. 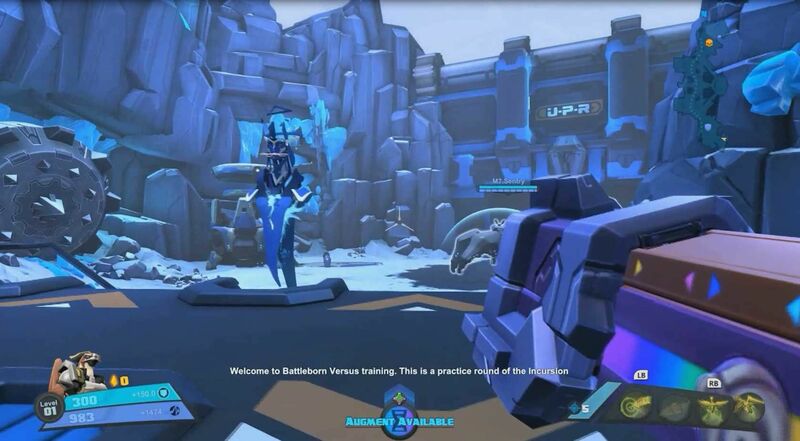 To help players learn and ins-and-outs of Battleborn, we developed a couple of training modes to teach players some of the chunkier aspects of the game. Our hope is that players will use these new modes to grow and learn in a consequence-free training environment. The Dojo is a single-player experience intended to give players a place to try out character skills, helix combinations, and gear loadouts. In the Dojo, all characters are available, so you can even try out the DLC characters before you decide to unlock them. The Dojo also runs as a mini-Meltdown match. Each time you enter the Dojo, you’ll go through a character select process to choose your hero and gear loadout, then you’ll start in the Dojo at level 5 with 100,000 Shards and five helix points to spend. Spawning every 40 seconds, waves of minions will become increasingly tougher as you progress. As you destroy minions, your in-match level increases and more helix levels will open up along the way. Minions move from one side of the room to the other, trying to reach a Minrec Grinder. If you kill them, you get points; otherwise they will score against you when they enter the Grinder. The goal is to reinforce the idea of killing enemy minions before they can score. There are no credit or XP rewards for participating in the Dojo -- just pure training. The room is set up to not only allow players to practice skills, but to also master movement and abilities of more mobile characters like Benedict and Caldarius. The Dojo provides a quick "get in and get out" experience if you’re just looking to get out a new gear loadout, or lets you stay longer to practice with a new hero and master their abilities before taking to the battlefield. The Incursion Tutorial is intended to dig down into the basics of Competitive Multiplayer in Battleborn. We listened to player feedback and developed this tutorial to help teach new players about wave clearing, taking out sentries, spending helix points, upgrading buildables, returning to base, and other fundamental mechanics of a Battleborn PVP mode. More of a traditional tutorial played against bots, this training mode uses a unique mini Incursion map where you can play against bots. An in-world Nova hologram will explain the purpose of sentries and direct players to guide their minions into enemy territory. When players approach various aspects of the game (buildables, Shard clusters, etc), Nova will provide some additional information as to how they work. This tutorial helps to provide information about the core in-match objectives so that when a new player enters a real match against others, they can spend more time thinking about the team strategy aspect of the game. The first time a player runs through the Incursion Tutorial, they will fight against an Oscar Mike bot, on a lower difficulty, in a single player-only experience. After that, the tutorial appears as a new menu option, and can be repeated with up to three players, using matchmaking to find players a team. Although there are no challenges associated with the tutorial, players will earn a small amount of XP each time they complete the tutorial.